Whether real or faux, kids love decorating Christmas trees, and we’re sure this recycled cardboard version will be no exception. Cloud Gate Designs introduced their 3 foot tall recycled Cardboard Christmas tree last year, and this year they’re selling smaller 1 foot trees too. The mini version with pop-out ornaments is the perfect size for kids to decorate with paint, crayons and glitter — and then to proudly put on display in their bedroom. These made in the USA trees are the perfect touch to add to a child’s magical experience of Christmas. Whether real or faux, kids love decorating Christmas trees, and we're sure this recycled cardboard version will be no exception. Cloud Gate Designs introduced their 3 foot tall recycled Cardboard Christmas tree last year, and this year they're selling smaller 1 foot trees too. The mini version with pop-out ornaments is the perfect size for kids to decorate with paint, crayons and glitter -- and then to proudly put on display in their bedroom. 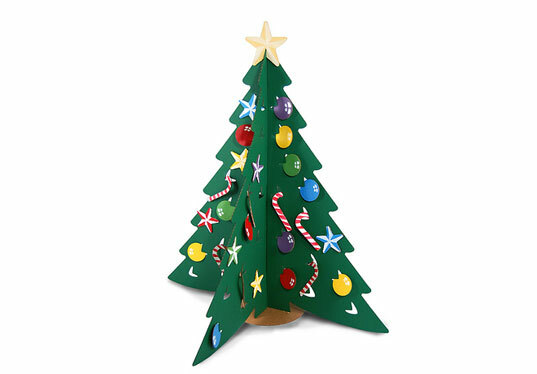 These made in the USA trees are the perfect touch to add to a child's magical experience of Christmas.